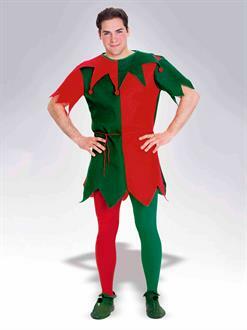 If you're dressing as one of Santa's Elves this holiday season, then you're going to need the Adult Red and Green Elf Tights. These tights will have you looking and feeling just like one of those fun, hard-working North Pole Elves. Let's be honest. It would be awesome to be an Elf. You get to hang out with reindeer, you play with toys all day long, and Ms. Claus always has a fresh batch of cookies baking in the oven. Become a Christmas Elf today, and buy your Adult Red and Green Elf Tights!